Caniggia Elva, a 17-year-old St Lucian-born (from Vieux Fort, son of Titus and Louita Elva), now Canadian national, from Calgary, football (soccer) player has been given a tryout by Arsenal of the English Premier League Team. 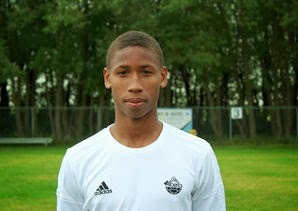 The teen currently plays for Calgary Southwest United, and he is currently used as an attacking midfielder. He already has an offer from a German club on the table. "I am extremely grateful and humbled by this opportunity. I am a lifelong Thierry Henry fan, and it’s a dream come true to be at this great club! !” wrote Elva via an email from England. Caniggia Ginola Elva from Podium Athletics on Vimeo. '96 born Caniggia Ginola Elva, a fierce attacking midfielder is apart of the SWU FC squad based in Calgary, AB. This video highlights his dynamic skill and extreme athleticism in 3 matches & 1 practice session over the course of the 2013 season. The footage was taken from a match at the beginning, mid-way and late 2013 outdoor season, which is a strong symbol of his consistent play style. A selected player for the Alberta Provincial Team & the Canadian National Training Program. Off the field, his character is strong and competitive which compliments his supportive play style as well as his go-to style of play. Many thanks to Foothills & Villains Soccer Clubs in Calgary for offering strong opposition that is shown in this video. Keep your eyes and ears peeled for Caniggia - one of the most talented and technical players to emerge from the Canadian scene to date. SWU Soccer Club - Calgary, Alberta.